What's the Best Solution for Your Application? There is no one perfect encoder type, only the type that best fits your application requirements. Even when incremental and absolute encoders are based on the same sensing mechanism, they deliver very different performance. Building a successful system requires understanding the trade-offs involved and making the right choice between the two. 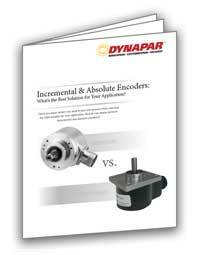 Download this white paper to learn how to choose an encoder that will help you build a product or system that delivers the desired performance and lifetime, on schedule and on budget.